Shenyang has developed into an international city, so for entertainment of visitors in Shenyang, there are numerous of options to spend the night, including some normal activities like singing in the KTV and getting to the clubs, cafés and teahouses. What&apos;s more, visitors also cam go skiing and watch the performances of Er&apos;renzhuan (二人转, Song-and-dance Duet). 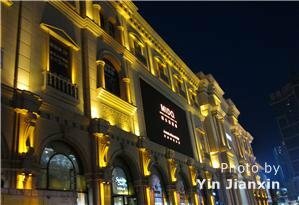 It is a club very popular in Shenyang. Customers need to order in advance if intend to go to the club. Sarmsara Pub is an old and famous pub in Shenyang with decoration in simple style, great bands, nice waiters and affordable price. The pub is so popular that if you get there after 22:00 in weekends, you will get no seat. It is a music club very popular in Shenyang; many local people regard it as the best music club in Shenyang. Comfortable decoration and considerate details (there are novels or magazines on each table, both whole-closed and semi closed chartered rooms and delicious food). From 17:00 to 18:00 each day, the beverage there is two-for-one. It will be a nice way to spend a night in Starbucks Coffee with listening to the gentle music, having some coffee, chattering with friends or just enjoying the quiet of the night. With simple and elegant decoration, exquisite tea sets and chartered rooms in different styles, Tangming Pavilion is boasted as the best teahouse in Shenyang. What&apos;s more, Muslim dishes are available there. It is one of the most popular teahouses in Shenyang with nice and quiet environment, exquisite dishes and wonderful tea ceremony performance. The song-and-dance duet is a unique folk performance popular in Northeast China, and it has a long history of more than 300 years. Humorous is the most distinctive feature of the song-and-dance duet. If visitors in Shenyang want to experience the unique folk performance, Laogen Liu Grand Stage will be a great option. Skiing in the night will be a different experience for the colorful ski resort decorated by lighting. The ski resorts will be not as crown as that by day; hence the trails will be wider. Fresh air in the night makes the skiing more enjoyable. Generally speaking, all the ski resorts will be closed at 22:00.